You will love using and displaying these cute flower dish cloths in your kitchen. Use this dish cloth crochet pattern from Lily Sugar n' Cream to make a few and keep in a bowl next to your sink. 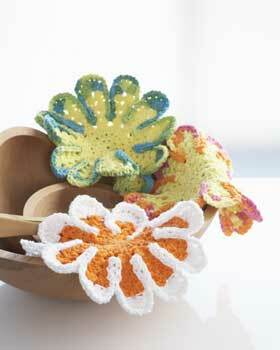 See this pattern and more in 23 Free Flower Crochet Patterns and Other Girly Crochet Projects. Size: Approx 10 ins [25.5 cm] in diameter. Note: Ch 2 does not count as hdc in 1st to 3rd rnds. With MC, ch 4. Join with sl st to first ch to form a ring. 1st rnd: Ch 2. 10 hdc in ring. Join with sl st to first hdc. 2nd rnd: Ch 2. 2 hdc in each hdc around. Join with sl st to first hdc. 20 hdc. 3rd rnd: Ch 2. 2 hdc in each hdc around. Join with sl st to first hdc. 40 hdc. 4th rnd: Ch 2. (1 hdc. Ch 1. 2 hdc) in same sp as sl st. *Miss next 2 hdc. (2 hdc. Ch 1. 2 hdc) in next hdc. Rep from * around. Join with sl st to top of ch 2. 5th rnd: Sl st in next st and ch-1 sp. Ch 2. (1 hdc. Ch 1. 2 hdc) in same ch-1 sp. * (2 hdc. Ch 1. 2 hdc) in next ch-1 sp – shell made. Rep from * around. Join with sl st to top of ch 2. 6th and 7th rnds: Sl st in next st and ch-1 sp.Ch 2. (2 hdc. Ch 1. 3 hdc) in same ch-1 sp. *(3 hdc. Ch 1. 3 hdc) in next ch-1 sp. Rep from * around. Join A with sl st to top of ch 2 at end of 7th rnd. 8th rnd: With A, ch 2. *8 dc in next ch-1 sp. 1 sc in sp between 2 shells. Rep from * around. Join with sl st to first dc. 9th rnd: Ch 1. 1 sc in same sp as sl st. Ch 1. (1 sc in next dc. Ch 1) 7 times. *(1 sc in sp between next 2 shells 1 row below. Ch 1) 4 times. 1 sc in same ch-1 sp as last sc. (Ch 1. 1 sc in sp between next 2 shells 1 row above) 3 times. ** (1 sc in next dc. Ch 1) 8 times. Rep from * 11 times more, then from * to ** once. Join with sl st to first sc. Fasten off. I'm having trouble beginning with the 5th round. When I get near the end, how many stitches should be left? I assumed there'd be 2 from the previous round, in order to have the pattern work out. What might I be doing wrong? I am having trouble from 5th Round. I follow the instructions, but then it sats "shell made' and mine does not seem to make a shell. What am I doing wrong? Hi there, this might be one of those scenarios where the shell will take form after you've crocheted a few more rows, or it will be more obvious the more you work through the pattern. Based on the instructions---2hdc, ch 1, 2hdc---that looks right for making the shell. Keep crocheting! :) The pattern should take proper shape. I hope that helps! They are just so cute. I read the directions, which were easy to find since they are right on the same page, and there is nothing to making these. The hard part will be picking out the colors you wish to use. I want to use them on the shelf in my kitchen as doilies. Cute for last minute gift-giving! I love that I can use whatever cotton yarn I have left in my stash basket to work these up- no wrong way to do it. A new apartment dweller would love these as well as your dear old granny. Bring a couple of these along in your picnic basket to wipe up grungy faces, too. My favorite combination would have to be a hot pink with a white border. These are really cute. There is no mention of hook size, so I went with a 4.5mm (US7). I crochet tight and I think that for me a 5.50mm hook may have been a better choice for this project. I love how quick they are to make. Another great stash buster! These are almost too cute to use to wash dishes. Maybe I'll set some aside just for decorating. There are so many ways to use these if you make them in different colors. I'll use some for coasters, and some for decorating my desk at work. @cszalay57 5594620 the manufacturer recommends a US 7.5 size hook for the yarn featured in this project. If you use a different yarn weight, you might want to readjust. Hope that helps! -Kaylee, Editor of FaveCrafts. how to go about the 9th round???? in row below. sure does not look like the picture! Hi jahanson, Thanks for your comment - I went back to the original pattern and updated this version according to the most recent instructions. Thanks! My result looks different too but it works better as a dishcloth - I skipped 3 hdc in between each 2 hdc - ch 1 - 2 hdc on round 4. That way I got 10 petals. where do you find the original Lilly pattern? This pattern does not make the pictured item. Please fix this. I made this and it is round not flower shape. Go to the original Lilly pattern. Whoever transcribed this missed a few instructions. On round 9, you single crochet around the ch 1 spaces you made in the previous rounds. This isn't very clear here. The original pattern is a bit clearer. I don't know, I must have misunderstood the directions,,I made this,,it is pretty, but doesn't look like the picture at all. Sorry meant to put 9th rnd not 8th rnd. I am having trouble with 8th rnd---can someone please help me? Explain what I am not getting? (thought this was an easy pattern :( ) thank you. With the second color make 8 double crochets in the chain 1 space. then 1 single crochet the between shells. Repeat to end. im self learning with crocheting, and im having the hardest time with 5th rnd. any advice? This is an excellent sale item for tea and sales. Thanks. This was a fun project. I'm a self-taught crocheter, still a beginning, but I found the pattern to be quite easy to follow .. perhaps a couple glitches, but I was able to figure it out, and I'm happy with the finished project. So far, I've only made one using scrap yarn. I'll be making more with all-cotton yard, or hemp. The only problem is that they are too pretty to actually use! I love the looks of these and have lots of the solid and varigated materials on hand for crocheting these. can you do a tutorial on this project, I cant zoom in on flowers to see where I'm going wrong, I guess I'm still a very slow beginner. PLEASE HELP!! I am a bit new to crochet, what does hdc mean? I would love to make these for Christmas presents next year! These flower dishclothes are so adorable!!! has anyone made any dishclothes with a scrubber with it it really looks good. I actually quit with row 7 because it was so large and it is still very pretty (looks like a doily) and will serve my purposes. These work up very quickly I made 2 in just my spare time tonight. I do not understand the last row and I have been crocheting for 60 years. When I made this dishcloth following the directions, it came out bigger than the picture. I then made it leaving out row 4 and it looked like the picture and it's very pretty. I've made about 10 of them and they are a quick project. Love this pattern. It turned out very cute. It took me a little bit to figure out the last row, but it was worth playing with it. Row 9 took me awhile to figure out, and I thought I was a quick old pro! The way I have figured it out, there is one error, otherwise the directions are correct, but I'll try to add some comments to clarify. The whole direction written for row 9 relates to one "petal", so when you repeat around, you will be doing it 14 times altogether. The "1 sc, ch 1, 8 times part goes around the outside curve of one petal, working into the 8 dc's of row 8. Then you sc in the next space between 2 shells--in other words, you are sort of working on top ofnext to the sc you worked in row 8, as you work into "the space between next THE WORD "NEXT" IS A BIT CONFUSING, TRY JUST LEAVING IT OUT 2 shells 1 row below", i.e., in row 7. Now ch 1 and work 1 sc into the space between two shells BELOW THAT, i.e., in row 6 ch 1 and work 1 sc into the space between two shells in the row below THAT, eg row 5 and one more time, to row 4. That is your 4 repeats of the "go below" parentheses. If you have never crocheted a project where you work down into a different row before, it might seem weird, but you are just sort of working on top of your project. Now you are going to work an sc in the same space, then you will start the go above parentheses to work your way back up to where you left off at the row 9 level--so--Ch 1, 1 sc in sp between next AGAIN, IGNORE the "NEXT" 2 shells 1 row above--in other words, back where you just were, then keep going back up. Here is where the real error is--you only repeat this going up parentheses 3 times, not 4, to get back up to the correct level to continue the row 9 pattern. When youre done and back up there, you begin the repeat of the whole show, where you will do the 1 sc, ch 1 around in the dcs of the next petal, etc., etc. Whew! If it werent for the photograph sort of giving me a clue, I definitely would have given up. After row 8 the directions were very unclear. I gave up and i have been crocheting for many years. Very cute cant wait to make this. Is there any way to get the pattern to print smaller so it fits on one page. The type size is huge. Rnd 5???? Plan and simple sl st to next ch 1 sp ch 2-1 hdc-ch 1-2 hdc in ch 1 space. 2 hdc-ch1-2hdc in nxt ch1 space around. What is so confusing about that......... the confusing row should be row 9 that is when you have to sc in previous rnds to form pedal look. Mine came out smaller than stated it should guess I crochet tighter. I have made this pattern as written and I love it. I've also made the same pattern with one less row and its just as nice. Thanks for another great pattern. Very cute and easy to do. I was a little worried after reading some of the comments. But if you look at the picture when doing the last row, you see how you have to 'outline' the petals. I have made three of these dishcloths and the all come out wrong. I can't get the last row . can anyone help me with this? I couldn't get the last row either I'm a LONG time crocheter-so I just went on around it let it lay flat. I didn't really care if it "cupped" on the edge because I wanted to use it as a hotpad for sitting hot dishes on the table. It works out great like that. Love it-will be making a lot more for myself gifts. I really enjoyed making this dishcloth. It is so cute. Makes a great gift. Thank you and HAPPY NEW YEAR! I made this pattern and the last row is a little bit tricky. You have to read the instructions a couple of times and you can get it. I used this pattern attached to a plastic scrubber. If anyone wants to know how I did it have them contact me. Help!! Sorry, I couldn't figure out the last row either. Can anyone explain it in a different way? I am having trouble understanding row 5. I am not new at crocheting, but I can't figure this out. Please help. Hi lonestar! I'm one of the Editors with FaveCrafts. You can contact the Designer, Lily for help with this pattern. You can contact her at httpwww.sugarncream.comcontact.php Thanks! I can not understand the directions on the final row. Is there any way to get help with that? I really like the pattern. these dish cloths came out so darling. i made set of three in coordinating colors as gifts that became the rave. ! !